The RBA has set things up to resume the easing cycle that began in 2011 (I never believed in the whole ‘neutral’ thing … see here). My current view is that the RBA will cut by 50bps in 2015, taking their policy rate to a fresh low of 2% by mid year. The most likely quarter for the cuts is Q2 – which is long enough to see the impact of the falling terms of trade in the data. So what happened? 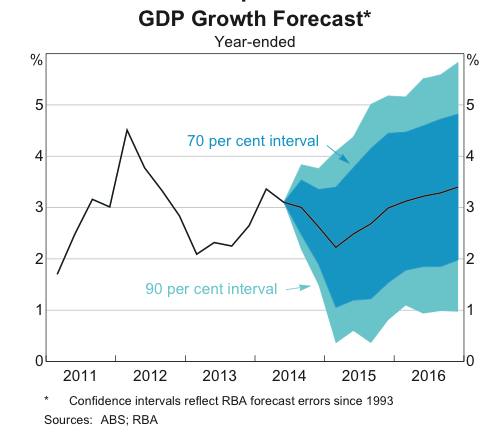 The RBA was wrong on growth: compare the above growth forecast chart (from the Q4’14 SOMP), with the below forecast chart (from the Q1’14 SOMP). The market (and RBA) got off the scent of a rate cut due to firmer than expected growth in early 2014, and now a fresh slowdown has shown that doing so was a mistake. 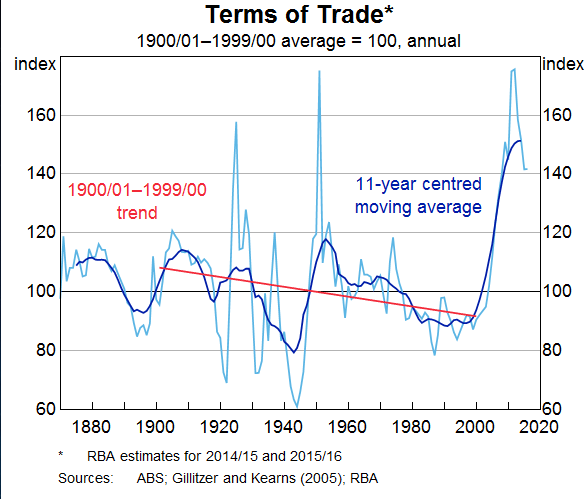 2/ Every other term-of-trade boom has ended with the terms of trade over-correcting to the down-side (the above is an updated chart from Gov Stevens’ most recent speech). I honestly think we’ll look back at the first five years of this decade as a period where the both the RBA and Treasury stuffed up royally. We’ve arrived at the end of terms of trade boom with a massive structural budget deficit, the unemployment rate at decade highs (and trending higher), and with core inflation at ~2%. This is not where you want to start the unwind process – it’s where you want to end it. A lower exchange rate is likely to be needed to achieve balanced growth in the economy. That means that a 2.5% cash rate an AUD TWI at ~68 is not going to get the job done. The RBA has little influence over the AUD, so that means they are considering cutting their policy rate. On present indications, the most prudent course is likely to be a period of stability in interest rates. This means not just that the most likely outcome is stable rates, but that there is a non-trivial probability that the right course for rates is not stability. Taken in combination with the above line about 2.5% cash and a 68 TWI being inappropriate, i think it means there is a decent chance (say 40%) that the RBA will cut their policy rate as soon as February 2015. A 25bps rate cut does basically nothing to the economy, and the RBA doesn’t do fine tuning so if they move i’d assume that they have at least 50bps to do. 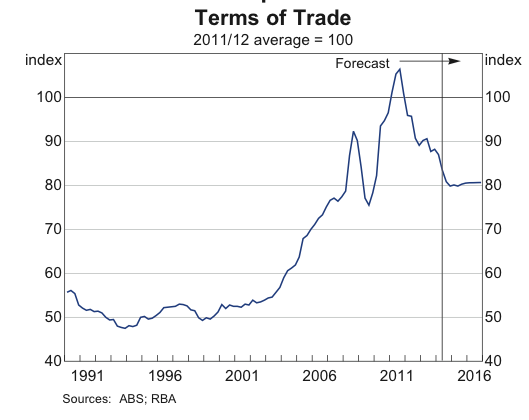 If I am right that the terms of trade are going back to average, 2% is unlikely to be the cash rate bottom. This entry was posted in AUD, monetary policy, RBA and tagged AUD, RBA. Bookmark the permalink. A very welcome back, too. Agree with most of your post. Two things though. First, I think after all this time, it will be hard for the RBA to not soften up the market in Feb by dropping the “period of stability” wording, notwithstanding the ‘likely’. If that expression isn’t worth at least a month of no change (although complicated here by the Jan break), it isn’t worth anything. So my guess is they will move in March (but happy to be wrong). More generally, I think the whole forward guidance experiment with “period of stability” has been a joke for a country not at the ZLB – it’s like the RBA has had North Atlantic central bank envy and resorted to measures that just aren’t needed here. My second point is that I only hope we will look back on this 5 years as a time of policy error. My fear is that the RBA – fixated as it seems to be on the absolute level of the nominal cash rate – will not properly see the light for the indefinite future. This doesn’t mean they won’t cut again, but that they will be too reluctant and tardy when they do so. That is a good way to get us to the ZLB. 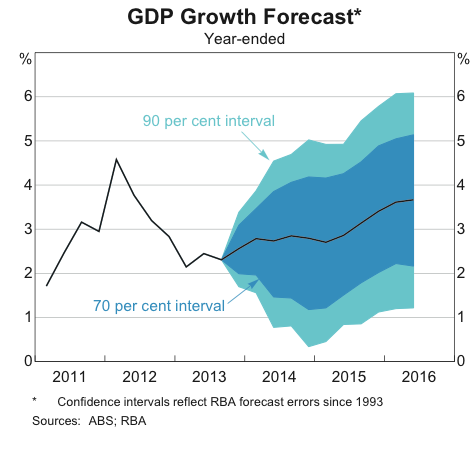 The RBA needs to think more about its messaging and the power of expectations; an extra cut or two in 2012 at appropriate times (eg Nov) to demonstrate their resolve to increase nominal growth could have put us on the path of lower unemployment and rising rates by now. Conversely, grudging cuts in response to poor data combined with framework-free panic about modestly rising dwelling prices just encourages people not to spend. I think the media has done an extraordinarily poor job at holding the RBA accountable for the outcomes to date; they too have been sucked in by our low nominal rates. I agree with your second point. The RBA’s ‘all folks need is confidence’ mantra drives me nuts … There is almost no information about tight / easy policy in the level of nominal rates. Firms and households respond to the *user cost of capital*, and we measure expected returns poorly, so it is not possible to say for sure if 2.5% is easy or tight. One thing is for sure, they have spent too long at 2.5% and having done so makes a trip below 2% more likely. grest to have you back. Assume for whatever reason we get back to trend Nominal GDP levels. no budget deficit. IF we get back to trend nominal GDP levels I think we will find a number of structural issues were in fact cyclical ones! I guess it depends on how you define ‘structural’. But there’s surely some truth to the idea that higher NGDP growth would reduce the deficit. After all, this is basically how every country that ever has produced a surplus has done so! I think the other problem with slow NGDP growth is that governments feel compelled to conjure up growth by engaging in wasteful spending. I suspect the new Victorian Labor Government is about to embark on that process. Sorry me again but a question to all the esteemed here. do you think the Authorities have missed the importance of nominal GDP? We haven’t here of course. I think the stuff-up was well before that, and it was global, in the lead to the 2008 financial disaster. But China and the commodity boom just delayed the inevitable, which other economies have already paid for or are still paying for. A lower dollar is probably necessary, but it won’t be the savior of anything. RBA can’t cut rates further now unless they make sure that they will not be inflating housing further. So maybe they should wait for further housing evidence in Q1 2015. The other thing to wonder is what have cutting rates achieved in the last 2 years? The economic issues in AUSTRALIA are entirely not related to the level of rates in AUSTRALIA right now. I would not cut rates if I was the RBA, unless the US Feds decide to not raise rates in 2015. That’s how I see it in summary: there is NO inflation anywhere in the world and a lot of ( bad ) debt, that is not deflating, that needs to be repaid. Technological advancement will increase productivity and keep inflation low for years. 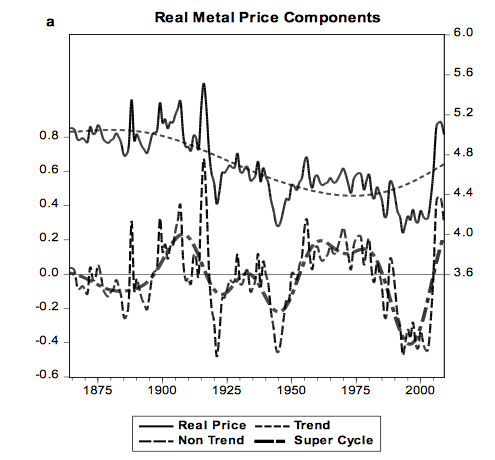 Just look at commodity prices now. Regarding rates remember guys we cannot go lower unless the housing market starts declining. There is no other economy in the world that has been cutting rates while house prices were up 8% y/y (as of today in Australia). If house prices are up the economy can’t be doing too badly!! We do not have the counter-factual, but i reckon we would have: lower gdp, lower house prices, less houses built, lower cpi and higher unemployment. Not much, because hikes and cuts do not do much – but a little. Yes maybe … but pushing housing higher with lower rates is a one trick pony. A trick that last about 30yrs – but can lock you into a genertion of very low rates. I am floating and intend to remain so. OK but the RBA was very clear they see housing as a risk now. They have repeated it in many occasions. Unless housing is going to clearly slow in 2015, I do not see how they can push rates even lower. We really need long term reforms from our politicians not short term palliative from the RBA. New record high 50.8% of all new loans to investors in Oct 2014 (and a lot of them are interest only loans made for maximising negative gearing to chase capital gains). Govt has to fix that then maybe we can start talking about cutting rates. Anyway, no one will want to cut rates with aud at 0.75 which will happen if fed raise rates in 2015. Not sure what the problem is with investor loans. Most small-scale investors would either only borrow 80% or else use their home equity as security on the difference to avoid paying mortgage insurance. UnN is at 6.3% and we are seeing very low bad debts on home loans. Yes, if UnN rises sharply (say, to 8%+ in the next 1-2 years), the banking system will have problems. It was ever thus. This nuisance tinkering will barely make a difference; just regulators covering their a*ses. Not much investor loans but loans that are interest only and where the 20% is paid with equity from an existing property. No new cash is put to work. Principal is not repaid for years. They are running at a loss (negative gearing) in the hope of capital appreciation. If prices start falling seriously, these are the most vulnerable as the existing equity is wiped out plus they are already running at a monthly loss, which is a subsidized by generous tax payers. If I have 40% equity in an existing real estate investment and I double my exposure with now just 20% equity in it, I call that significantly increasing my risk profile. Add to that a lot of investors borrowing withing their super-fund, there is no diversification here, it’s all the same multi-billion dollar bet. Anyway I thought the US and Europe real estate collapse had thought some lessons, but apparently it has not? It is increasing your risk profile, but within reason. But if I lose my job, I am selling either way. Someone has to buy the homes that all those young people are choosing to rent instead of buy! The article you linked to suggests that some investors might be young people who have decided to buy to rent rather than buy to live. Even if there was 100% substitution from living in to renting out dwellings, I’m not sure there would be a problem. (Are you more likely to lose your job and stop paying your mortgage if you are renting out your place rather than living in it? Possibly, but probably not to any great degree.) But it’s more likely many of those investors are older people with more equity and more stable jobs. To the extent that’s the case, I would say that more investors + less FHBs = less risk of bad debts. Funny that you mention FHB renting instead of buying. That makes perfect sense. Renting is cheaper (you get more house for your money) and renting your investment property is tax deductible. So two owners renting properties to each other pay less tax than two owners living in their own property (if they all never sell)! I guess it’s a way to workaround affordability…. and in the meantime the govt budget gets more and more into red. Scenario A involved a housing market double-dip prompted by a sharp slowdown in China; Australian GDP growth declines to -4 per cent and then struggles to return to positive territory for a couple of years; unemployment increases to over 13 per cent; and house prices fall by almost 40 per cent. Scenario B involved a higher interest rate scenario. I do not see how they would withstand scenario A honestly. I think they are miles away from being able to withstand Scenario A. Considering 50% of all the loans currently written every month are to investors, interest only and 80% LVR, and they would all be under water and loosing money being negatively geared. People would stop renting and go back living together, stop immigrating to Australia, go back and the “shortage of dwellings” would disappear in a second. I think scenario A is crazy and scenario B is unlikely to cause much harm, unless it leads to scenario A. In my view it would be extremely inefficient for the gearing of Australia’s banking system to be regulated in anticipation of anything remotely resembling scenario A.
It’s a question of balancing risks and efficiency at macro level. Not easy. From Mac Bank’s view this mist look lole a load of anti-competitive bollox … And they are right. (1) The general relaxedness of his reading of the state of the economy… eg outcomes have been broadly as expected – read: “it’s you [people with the problem], not me”, basically, “get used to it / SIU”. (2) The reluctance to cut rates further… the idea that the cost of borrowing is not a constraint on investing, that there are both pros and cons to cutting further and that animal spirits are exogenous and not driven by policy. As a Sumnerian / market monetarist, I don’t believe monetary policy works that way. (3) The idea that he needs a ‘positive narrative’ for further cuts, suggesting that maybe low inflation outturns and moderating asset price growth are legitimate reasons for cutting rates, but not low consumer confidence and sluggish nominal wages and employment growth. Sure, they have an inflation target, but waiting for a negative oil price shock to justify cutting rates seems like it’s taking that mandate too literally. If he wants a positive narrative, how about saying that things are okay, but that the RBA thinks the economy could and should be growing faster and is keen to help make that happen. Of course, that would mean accepting responsibility for the last 3-4 years’ failings. I worry that like the Bundesbank and the previous BoJ, the RBA believes that it has the right and the duty to keep the screws tight to force the hand of politicians to undertake perceived necessary fiscal/structural reforms. That’s ultra vires, guys! (4) The kooky idea that more stimulus could and should come from a lower nominal exchange rate, which is a lever he does not directly control, but not via rates, which is a lever he can control. Overall, I thought the interview showed Stevens’ intellectual framework had not evolved since his appalling “Glass half-full” speech of mid-2012. Now, my mate at Evidente reckons that they will still cut in Feb after the Q4 CPI, but the market certainly wound back its expectations. If house prices were falling or stable and credit growth not accelerating as it has been, they would have cut already. They will not cut until that happens, too risky otherwise. Financial stability must be the #1 priority. Secure the banks first and their capital inadequacy, then the RBA can lower rates to zero if needed. We’ve had this debate many times, but I think the biggest risk to financial stability is slow growth in nominal income and rising unemployment. Avoid that and you can stop worrying about house prices and bank capital requirements. RA, will you be writing about MYEFO? did you read David Glasner’s article about John Cochrane , Richard Lipsey and Kenneth Carlaw at all? Probably not about MYEFO … And no i did not read that article. Can you link to it please? You do not read my Around the Traps! Disgraceful. Let us just say that I have been off the circuit for some time – but with good reason. By the way do you still think the RBA will cut given Glen’s interview with the AFR? That will be the subject of my next post. Short answer is yes. You? Yes if James Hamilton is correct, and thus China is slowing. Oil prices and commodity crashing… just fantastic news. This is what the world economy needs not more fiddling by central banks. You will see the world economy in full recovery mode next year if prices stay this low, much better than rate cuts and money printing. Technological and productivity advancements like this is what improves our lives not financial tweaking. Can you believe how much iron ore can BHP and RIO extract in a month now?! That is real, tangible wealth for the world. Perhaps an article on why the $A has stayed so high for so long? This has not only perplxed me but also Glenn! Simply AUD levels have been dictated by monetary policy in the US and commodity prices. It is suspect however that as soon as QE stopped and US rate hikes were on the table commodity prices crashed , makes you wonder if it is a coincidence and how much speculation was in there. What I am saying is that AUD is probably the most impacted currency in the world by US monetary policy since commodities are priced in USD. So exceptionally low rates in the US have resulted in exceptionally high AUD. Couldn’t agree with you more. This will surely go down as the most poorly managed boom in the history of our country. Add WA Treasury into that basket of course. There is a quite significant adjustment lying ahead. The earlier this govt goes home the better. Gutless, spineless rubbish. John Cochrane gets mauled. Mind you he did say some daft things. PS. I think Noah and Robert are better than Brad. Not defending Cochrane, but I think DeLong, Krugman and other Keynesians were clearly wrong that the sequester and various tax increases would have a major impact on US GDP. They didn’t, thanks to relatively expansionary monetary policy. The NK model is broken and awaits an overhaul. The lack of deflation following the GFC / demand shock is a problem. Saying inflation expectations were robust is just as empty and untestable as the RBC folks saying there was a recession due to an expectations shock. I find the whole thing a bit of a bore. Aren’t both sides shooting at caricatures of each other? Science isn’t a popularity contest, and a majority of doctors and physicists have been wrong about truth at times. Crikey you can’t even say Cochrane was wrong at all? He makes a number of claims but never backs them up. It is almost he doesn’t understand what Keynesianism is and had not looked that the statistics. Ricardo, Ricardo, where art thou? Now that the CPI has come out, I think we all expect and deserve a post before next Tuesday! You were spot on this…. congratulations. Now the real question: will Australia be at ZIRP in 3 years and the AUD be at 0.50 vs USD? Will IR in the US be higher than in Australia by then??? You see, we are having a residential construction boom right now but we run the risk of building too many apartments in an attempt to fill the gap left by mining. The question is: who are we building all these expensive houses for. What if we are building too much???? Are we not going to be left with idle mines and empty apartments?